TV show dates: March 7, 2018 — present. Performers include: Jim Sturgess, Agyness Deyn, Nikki Amuka-Bird, Jojo Macari, Derek Riddell, Owain Arthur, Varada Sethu, Adrian Rawlins, Lorraine Burroughs, Aisling Bea, and Joplin Sibtain. 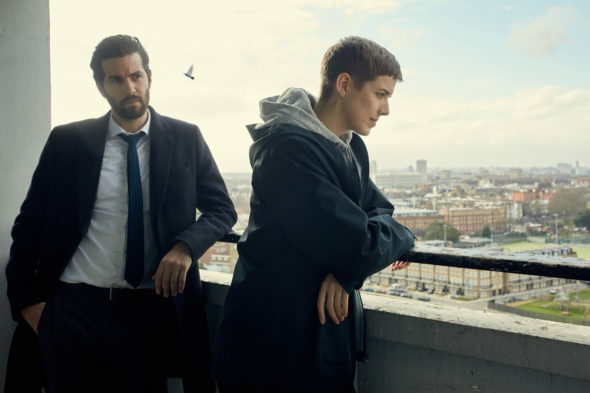 A pre-apocalyptic crime drama from Luther creator, Neil Cross, the Hard Sun TV show centers on DI Elaine Renko (Deyn) and DCI Charlie Hicks (Sturgess). Although Renko and Hicks are mismatched, these partners are out to enforce the laws and keep safe their loved ones, as encroaching natural disaster threatens to end the world. Although he’s a family man and a devoted officer, DCI Hicks is also thoroughly corrupt. Meanwhile, Renko is a clean as they come, but she has some issues that run deep, and isn’t the easiest person with whom to work. Despite their differences, and a sizable lack of trust, Hicks and Renko have to learn to work together. Their very survival depends upon it. While investigating a murder in London’s inner city, the duo uncovers proof that the world will be destroyed in five years. Because the British government is desperate to keep that information secret, Security Service (i.e. MI5) operatives are out to silence them — permanently. When a classified dossier on the subject goes public, the government sets to work to discredit it as nothing but a hoax, which largely quells the public. In the Internet age though, nothing truly goes away. Hard Sun becomes fodder for cult leaders, murderers, abusers, and even serial killers. In order to keep people safe, Charlie and Elaine have to take down those who would exploit the crisis, but the impending end of the world has them questioning what justice even means. Since the government is out to get them, they must use every weapon in their arsenal in order to protect themselves, as well as their near and dear. What do you think? Do you like the Hard Sun TV series? Should this TV show be cancelled or renewed for another season on Hulu? More about: Hard Sun, Hard Sun: canceled or renewed?, Hard Sun: ratings, Hulu TV shows: canceled or renewed? Omg. Hard Sun is the most interesting series I have seen in a long time. Why stop it? The story was so amazing, the actors were first class,… Everything about it. Please someone, pick up this series. Hulu obviously did not know a gem when they saw it. A fantastic police drama show, should definitely have more seasons! A real favourite of mine!! My wife and I love this series already. We certainly do hope they keep it going. Thrilled to hear that this wonderful show has been renewed. So looking forward to seeing the season. While it’s an interesting show I wish it make up its mind what it wants to be: a sci-thriller, a cops and robbers, government conspiracy show. The acting is great and it’s nice to see Jim Sturgess play a role that is so out of his traditional roles. All of that being said it does take a couple of episodes to get the audience hooked. This is a limited number of episodes series and its renewal depends on how TV broadcasters in the UK do their ratings. Very good show. Hope it comes back. I like this show, I hope it doesn’t get cancelled. The main characters work really well together. I am totally obsessed with it. I honestly can say this show will get you really hooked on them. It had me on the edge of my seat every night I watched and begging for more. I am so glad it was not cancelled. This is a show that will have you thinking all the time, “what’s next” lol. Love it! I agree Donna. I have never seen their work before so for me not having any pre-conceived ideas of who they are helped me. The main characters are fantastic and the story lines are always keeping you guessing. I am just blown away.